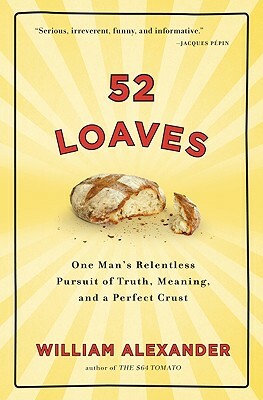 The basic premise of William Alexander’s recent book, 52 Loaves, like his first title The $64 Tomato, is that the author becomes so obsessed with a particular project, in this case creating (and growing wheat for) the perfect loaf of country bread, that he devotes a year (hence the title) and a great deal of energy and money, in the pursuit of his goal. I’ll leave aside the obvious shades of mid-life crisis that dominate the book’s context, and I’ll ignore the far-too-frequent-for-comfort discussions of Alexander’s marital relations that I feel like he included to appear less of a nerd than a bread-obsessed IT director might otherwise, and focus instead on the fact that, as with many quests, his journey ultimately became more important than his goal. Alexander’s aim may have been to master the art of baking au levain country loaves at home, but in the course of his year-long peregrinations across North America, and to Morocco and France, and wittily transcending his middle-aged, obsessive-compulsive suburban dad identity, he finds much more than a faultless bread recipe, becoming a fount of fascinating knowledge and experience about life and human history. Many of us, I’m sure, secretly dream of jacking in our workaday lives in the urban rat-race and retiring to a country town to bake delicious breads (or insert artisan career of choice), but Alexander disabuses the reader of this romantic notion through his own strenuous baking experiences as a boulanger for forty monks at the Norman abbey of St. Wandrille. Certainly, hobbyist bread bakers can learn a great deal from the author’s efforts, and benefit from the distilled information he provides in the form of recipes in the appendices, but for me, the most interesting aspect of 52 Loaves is that it raised a thorny issue Michael Steinberger also makes in his recent book Au Revoir to All That, that I was reading concurrently, namely that in France, the country many of us believe to be ground-zero for all that is good in bread baking (not to mention gastronomy in general), there is hardly a decent loaf to be found. Projecting his theory that a 1,300 year old abbey must be the place to find (and make) artisan country breads, Alexander finds, to his dismay, that not only do none of the monks know how to bake but that even obtaining the correct kind of flour and yeast is nigh-on impossible. Echoing a situation Steinberger also laments, Alexander questions how things got this way as he finds himself smuggling pots of his wild yeast starter into France when traditionally all the knowledge and great products have been coming the other way. Of course, recently the French have become a convenient punchline in America for all manner of jokes about their military prowess, supposed lack of backbone and preference for industrial action over actual hard work, and one might be forgiven for thinking Steinberger is cashing in on that incipient anti-Gallic sentiment to herald the demise of the only areas in which the French have typically led the Anglo-Saxon world: food, wine, and artisanal production thereof. In fact, Steinberger is a self-declared Francophile whose enviably thorough research at many of the finest tables, markets, farms and vineyards in France must have caused him terrible distress as he found that a disastrous combination of a poor economy, confounding government regulations and a saddening disregard for traditional French food culture have led to a serious decline in gastronomic excellence. Alexander notes the irony of an American computer guy teaching French monks how to bake bread, and Steinberger points to the French Culinary Institute’s 2006 Gala hosted by a bevy of Spanish chefs and not a single Frenchman as evidence of the “end of France”, but it is, all the same, hard to believe that an entire nation’s cultural identity is vanishing to such an extent that hobbyist Americans and a little competition from a resurgent southern neighbor have supplanted centuries of tradition. Indeed, one of the underlying biases of both books is that we in America (and Britain), who have recently emerged from a centuries-long gastronomic Dark Age and have finally embraced the notion that food coming from small, craft producers is better in myriad ways than that of the industrial conglomerate (something we owe in no small measure to our Gallic cousins), are somehow now able to preach this message back to the French and that the joke is on them. Certainly, Steinberger’s book is persuasive and raises legitimate concerns about how government regulation of cheese making is precipitating the extinction of some of France’s most famous lait cru, or raw milk, cheeses, but I can’t help averring that those who live in glass houses should not throw stones. While USDA regulations still rule out the importing of French raw milk cheeses, not to mention actively discouraging domestic production thereof, there is comparatively little hope of their persistence here or there. Moreover, if it is the attraction of McDonald’s and Wonderbread that is behind the decline in traditional French bistrots and artisanal country loaf baking, then who is to blame – the country who popularized both and, now, finding itself now saturated and obese as a result, is looking to export them to maintain share prices, or lower middle-class French families struggling to make ends meet in a global economic downturn? If there is a message to be taken combined from both titles it is perhaps an obvious one, that wherever one finds oneself (to a greater or lesser degree depending on location), and whether it be haute cuisine, organic wheat flour or artisanal raw milk cheese, fine food remains a bourgeois passion really only available to those whose considerable purchasing power offers the option to choose. Evidently, a world where delicious, nutritious, locally-grown and organic foods are available to all is the ideal and a goal worth striving for, but until, through government intervention or other means, and especially problematic in a persistently bad economy, these food stuffs are price competitive with the products of industrial agro-business, it is too early to start congratulating ourselves for having seen the light and pointing out the fault in others in the grip of lower-grade processed foods. I also read a recent blog post on Stuff Parisians Like about the current mania for baguettes tradition, suggesting the appreciation of good bread is still alive and well, at least in Paris. I interviewed Alexander for an article a few months ago. He’s got a nice, humorous level of self-awareness in person that comes through in the book, and his bread is good. What’s most interesting to me is that he ended up with a high level of mastery and yet his recipe is extremely simple and basic. He spent a year of consuming obsession arriving at a loaf of bread, while I picked up the first recipe that really worked for me and was happy to just run with it. This is why I’m not a scientist. Haven’t read the other one, but people have mentioned it to me. I’ll pick it up. Nice job threading them together. For as discouraging as it may be, this is a message that MUST be heard — making great food accessible to everyone is a lofty goal, but there have to be ways to make headway. Fortunately, there are also success stories to be read — like those of Will Allen here in Milwaukee, WI whose urban gardening program is bringing food to the masses AND educating youth about where their food comes from. @Lo – I completely agree. Will Allen is doing fabulous work, as are the folks at NY’s science barge. To my mind, the most difficult thing is not making the argument that local, organic food is better, but rather changing American land-use models to prevent even more prime farmland being turned into sub-divisions of McMansions. This is but another component of the fossil-fuel economy we need to address. @Peter – interesting that you’ve spoken with him. He certainly does come across as approachable and humorous. It’s equally interesting that he spent a year perfecting and simplifying a recipe. I guess it proves what many of us already think is true that great ingredients don’t need us to do much to them to produce great results. And, there is zero likelihood of me ever sustaining such an obsession either, which is why i’m neither a scientist or a baker! @Noelle – it does feel like a depressing read, but much less so than something like Fast Food Nation. 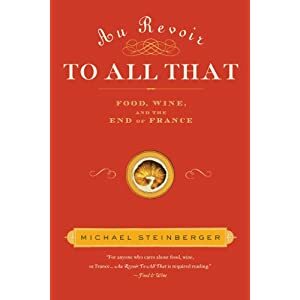 Steinberger suggests it is the younger French who are either ignorant or uninterested in their country’s gastronomic traditions, but, as you say, resurgences of interest like that do indicate all is not lost. Sorry, hit something in error …when Julia Child was learning to cook there in the 50s but it still does have the history of cooking and gastronomy that most other countries do not. Reading David Lebovitz keeps my spirits up that not all is lost in France. I knew nothing about either of these books and now I would like to read both. A beautifully weaved review sir. I fear (often) Italian bread is not what is used to be. What’s even sadder is that unlike the Uk – where we generally admit our food short comings and have a real humility in our present (small but exciting) food revolution – the Italians seem to find it near impossible to admit they have a bread, baker, wheat, yeast crisis. I just reviewed 52 loaves…I liked it. @Rach – as Amy (my wife, the counselor) would agree, the first step to fixing a problem is acknowledging that it exists. ← This Just In: Farmer’s Markets in Selling Fresh, Local Produce Shocker!